A drug user told a court how he had been 'tortured' by a Hartlepool man accused of murder. Kieran Lewis said he owed money 'for about 10 years' to Darren Willans, who supplied him with drugs. Police at the scene in Melsonby Court, Billingham. Willans and Derek Pallas are on trial for the murder of Peter Gilling, a 39-year-old drug user and friend of Mr Lewis. "I've been assaulted, brayed, stabbed, had a bottle bounced off my head," said Lewis of Willans. "He has tortured me all my life. "The debt was about £300, but I went to prison, and when I came out it had doubled. "I was on benefits, and just could not pay it." Under cross-examination from Richard Wright QC, for Willans, Lewis conceded that he had previous convictions for witness intimidation, and offences of dishonesty. "I have a past," said Lewis. "You are trying to make this about my past, but it's not about that. "Peter Gilling was a good friend of mine, he was a good friend of my family. "I want to see those who killed him put away, I want to see the people who I know done it put away." Mr Wright told Mr Lewis he could not know who had killed Mr Gilling because he did not witness the incident. The jury at Teesside Crown Court heard earlier Mr Gilling died from a stab wound after a chance meeting with Willans and Pallas outside Melsonby Court flats in Billingham. Prosecutors say Willans held Mr Gilling responsible for a burglary in which a quad bike was stolen. 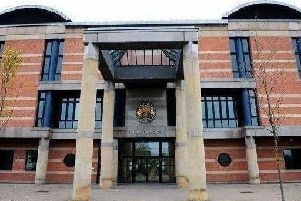 Willans, 31, of Warren Court, Hartlepool, and Pallas, 36, of Marsh House Avenue, Billingham, both deny murder on September 29. Both men admit being with Mr Gilling shortly before he was fatally injured, but they both deny stabbing him.